Providing you the best range of pr fashion launched beautiful designer bangles with effective & timely delivery. Get This Lovely Pair Of Bangles To Wear It With Your Ethnic Wear. This Pretty Pair Can Be Wore Single Or Can Be Mixed With Other Simple Bangles For Heavy Look. 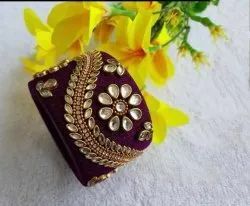 Grab This Very Pretty Set Of Four Bangles To Pair Up With Your Ethnic Wear, Also You Can Pair It Up With Same Or Any Contrasting Colored Attire. This Pretty set Is Available In All Sizes. Grab This Beautiful Heavy Kada Type Bangle Which Is Wore Single In Hand. And It Does Not Need Any Other Bangle To Be Paired With. You Can Pair It Up With Any Same Or Contrasting Colored Ethnic Attire.